Time Magazine's September 7th edition said South Africa only exports wine that is "crud." No, they didn’t say South African wine is crud. They actually praised SA wines but stated that the best wines are consumed locally while the "crud" is being exported. Personally I think this is a half truth. Yes, some great wines don't get exported but some great wines do. On Saturday, September 26, about 40 heavily armed men ambushed a meeting of the Kennedy Road Development Committee of Abahlali baseMjondolo, South Africa's shack dwellers’ movement. It was an organized attack and it seems that members of the ANC were involved. The shack dweller movement also states that police were very well aware that the attack was going down and left the area before it happened. At least two people died. Well, a tough stance on crime is very important. I believe police should always use the least force required to combat crime and arrest criminals. A trigger happy police and stray bullets isn’t anyone's friend. Tomorrow they mistake you as a robber or something and blow your head off. I do believe that anyone that even reaches for a gun when the police try and arrest them should be shot. The police should protect themselves and the law should assist them. South African Airways (SAA) reported a profit for the year ending March 31 of 398 million rand (53.8 million dollars). Well done SAA. What a unique way to reintroduce the death penalty without anyone noticing. Lovely stuff. the SA wine i buy in japan is NOT GOOD... makes me sad! WE HAVE MOVED. - Hi, We have a new home and you can link to it here: *https://africanwanderlust.wordpress.com* Thank you for reading! And just like that it is over - The end of a friendship is always difficult. When do you finally close the door and walk away ? After 17 years I have decided to walk away. 2010. Woza Wanderer - My SAKI wandering and wondering continues in my Woza Wanderer blog. 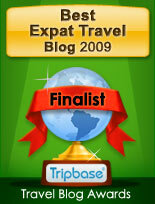 If you are a SAFFA working overseas and you blog, list your blog here. Leave a comment for me to link you. It is as easy as that. Also let me know of any Saffa related events in your area and I can post it here. Jesus found in Dubai mosque. Mr. Apartheid is armed and dangerous! Congratz to Wandering Saffa Chick! Are whites and other minorities under attack?